It's been a long time since I've approached a film with such low expectations and have yet been so delightfully rewarded as I was watching Transformers. This 140-minute, blow-em-up, special-effects Michael Bay extravaganza didn't lose my attention from beginning to end. And even more surprising, made sense from beginning to end. This is rare in the bubblegum science-fiction genre. Independence Day and The Matrix, to cite two examples, are based on mind-numbingly stupid premises. In the one-off blockbuster format, you can usually turn your brain off long enough to get past it. In the case of Star Wars and The Matrix, though, the persistence of the original premise through subsequent sequels only painfully pounded the stupidity into your skull with a heavy mallet. Transformers uses the reliable capture-the-flag plot: the good guy team and the bad guy team after The Prize. (Or one team already has it and the other team is trying to get it back.) If handled competently, it's hard to get wrong. Star Wars starts out this way, which is why it works so well in the first installment (ignoring the dumb Freudian subtext injected after the fact, and the criminal incompetence of the Empire's Death Star Engineering Division). In Transformers, the bad guys--the obviously-named Decepticons led by Megatron--and the good guys led by wonderfully-named Optimus Prime--are after the All Spark, a sort of robotic Philosopher's Stone in the shape of a Cube (looking very Borg-ish in the intro). The bad guys want the Cube so they can rule the universe (why else?). And the good guys want the Cube so the bad guys won't end up ruling the universe (stop me if you've heard this plot before). Sam Witwicky (Shia LaBeouf ) ends up at the crux of the conflict when it turns out that his great grandfather discovered--very X-Files-like--a frozen Megatron and the Cube during an expedition to the Arctic. Megatron's buds have finally deduced he's on Earth, and are alternatively hot after government databases and Sam for clues. This is when Sam finds out that the used Camaro he just bought is a sentient robot in disguise--one of the good guy robots called Bumblebee. After a detour through Hoover Dam (yet another secret government installation, didn't you know), the always-entertaining destruction of a major American city follows. Like I said, once the premise has been established, this story works like the well-oiled machines these Transformers are (the mecha CGI is worth the price of admission). The bad guys pretty much do what bad guys ought to do, and the good guys pretty much do what they ought to do. Keeping Sam at the center of the action during the big climax strains common sense, but no more than farm kid Luke Skywalker suddenly being able fly the equivalent of an F-22. The action is so well-paced that you don't have time to think about the logical failings too deeply. The movie plays out with the same sense of seriousness as The Tick or George of the Jungle, yet without embarrassing itself. More kudos to Bay on that account. But perhaps most remarkable of all is how fairly the Bay treats the U.S. Military. (Sad that this should be so remarkable.) Granted, there's always some bureaucrat in these movies whose monumental cluelessness becomes an excuse to drag out of the resolution of obvious plot points. That job is handled here by John Turturro. Thankfully, he proves a minor distraction. The rest of the Armed Forces, led by Captain Lennox (Josh Duhamel) as a Special Forces officer, and a competent Jon Voight as the Secretary of Defense (he's good with a shotgun too), execute their jobs with the skill and expertise we all hope the Pentagon will muster if the country is ever invaded by a bunch of giant, power-mad, marauding robots. Even the de rigueur FBI-guys-busting-in-on-the-genius-teenager-hackers scene made me think: Yep, they deserved it. I also like the fact that the military figures out a way on its own to cause serious damage to the bad guys. None of this nonsense with Jeff Goldblum uploading a virus from his Mac to an alien operating system he's never seen before (as my brother said of that conceit: "You might as well try to upload a ham sandwich"). A single cheap shot aimed at the current occupant of the White House is so glancing that nobody will get it in a few years. The icing on the cake are two truly funny and clever sequences that keep the story going before things start blowing up. In the first, Bumblebee does his best to help Sam get to first base with his new girlfriend (Megan Fox). This before Sam concludes that his Camaro really does have a mind of its own. The second has Sam rooting around his room trying to find The Important Clue while a bunch of gigantic (good guy) robots right outside the house are trying their best Not To Be Seen by his parents. And not step on the Chihuahua (rest assured, they don't step on the Chihuahua--they're the good guys--but the rest of the lawn ornamentation isn't so lucky). These two scenes are out-and-out funnier than anything in The Simpsons Movie, or any other recent comedy I can think of. Turning Michael Bay's name into a hiss and a byword has become a popular sport among intellectuals (Pearl Harbor certainly was a stinker). Yet Transformers is not only the best thing Bay's done since the first Bad Boys, but there's more to admire about this film than most of the year's Oscar and art-house circuit competition. Starting with the fact that it's actually fun to watch. 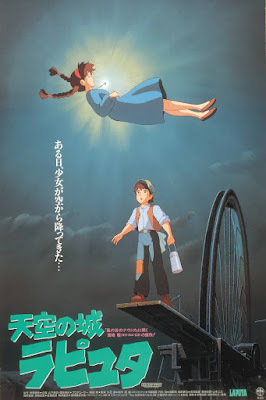 Castle in the Sky is a visually dazzling though somewhat less emotionally rewarding transitional work between the first and third installments of what could be called Hayao Miyazaki's "flying arc." As with Nausicaa of the Valley of the Wind (1986), the story turns upon the quest for the technology of a vanished civilization, the threat of environmental catastrophe it could unleash upon the world, and fate of the young girl who holds the key to both. And like Kiki's Delivery Service (1989), Miyazaki creates an alternate-history Edwardian Europe as a backdrop, replete with Dickensian villages emerging from a medieval past into the sunlight of a modern era, its skies crowded with whirling, chattering, steaming Rube Goldberg-powered dirigibles and autogyros. It's as if Miyazaki was determined to commit to celluloid every Popular Mechanics cover illustration published between 1900 and 1950. The cautionary tale that Castle in the Sky tells--of power corrupting absolutely--lends it a far darker tone than Kiki's Delivery Service. Although the violence is less explicit than in Nausicaa (the more brutal consequences occur mostly off-screen), the abrupt shifts from pratfalls to people dying en masse is disconcerting. This dramatic imbalance extends to the conflict between Sheeta (an obvious counterpart to Nausicaa) and the evil, conspiring Muska. Compared to other Miyazaki villains--the corrupt monk Jigo in Princess Mononoke, General Kushana in Nausicaa--bad guy Muska is all black hat and not much else. The best parts of the movie feature the sky pirate Dora and her four bungling sons. Both as comic relief and even in terms of character design, the not-so-dastardly-after-all quintet hearkens back to Miyazaki's pre-Ghibli work directing Lupin III: The Castle of Cagliostro. Except that Lupin III is a slapstick adventure series. I don't sense that was Miyazaki's intention in this case. The result is that a mixed message lacking the ideological consistency of Nausicaa or Princess Mononoke. Yet it holds up remarkably well on subsequent viewings, and visually is a wonder to behold. The intricate design of the floating city, the details of the aircraft, and the daredevil flying sequences are flat-out breathtaking. Simply as a showcase for the amazing span of Miyazaki's creative genius, Castle in the Sky should not be missed. "It began with a seasonal greeting"　Traditional Japanese letters still begin with a seasonal greeting (時候の挨拶). Otherwise (and more commonly these days), the expression zenryaku (前略) is used instead, meaning "to dispense with the introductions." The girl Youko is reminded of is Rangyoku from A Thousand Leagues of Wind. Keikei is her younger brother. Japanese grammar is quite straightforward. To start with, no case or gender or articles to worry about. And with only a few exceptions the phonology is a cinch. But Japanese orthography was devised in the very bowels of hell. Despite inventing a simple syllabary called kana (it was good enough for Tale of Genji, the world's first novel), Japanese then adopted kanji from Chinese (with which it shares zero linguistic similarities). And then 1500 years later started using the Latin alphabet to boot. There are actually two types of kana: hiragana for writing native Japanese words, and katakana for writing foreign "loan words" (cognates). Once typeset print became widespread, a third type emerged: furigana. Furigana are small kana characters set adjacent to or atop kanji that instruct the reader how to pronounce the kanji. These characters mean "vast store of knowledge." The furigana spell out the pronunciation: unchiku. The first character is "nonstandard," meaning that it is not taught as one of the 1945 "general use" kanji. But the average Japanese would recognize the word from the pronunciation, the same way English speakers know far more words than they can spell. Believe it or not, while it's a bear to learn, reading Japanese with kanji is easier than reading Japanese without it. (Writing, though, is another matter entirely. Equally true of English.) But there are other ingenious uses for furigana + kanji as well, such as giving kanji invented or nonstandard phonetic readings (ateji). One is to introduce foreign words into a narrative. This is common in science fiction. By pairing the katakana loan word with the kanji, the meaning becomes apparent to the reader. On the right, unisex is paired with the Japanese kanji meaning "gender neutral" (chuuseiteki). Any doubts about the English meaning are cleared up by the kanji. A second is to artificially embed a single word with two associated meanings. Here, the English word "slum" is paired with furusu, meaning an "old haunt" or "place where one grew up," meaning a "childhood home in the slums." Lastly, a recent invention that shows up a lot in manga, where dialogue balloons can put space at a premium. You should be able to guess this one yourself. The reading of the kana (not a kanji) is waza, an adverb that means "on purpose." So what does adding that furigana 2 mean? Waza-waza, of course. Meaning: "really doing something on purpose." This works well in Japanese because so many adverbials and especially onomatopoeia are expressed as trochaic pairs. 1. TP: Rakushun arranged for lodgings at a comfortable inn as soon as they arrived in the next town. There they paused for a few moments while he wrote a short letter to the taiho, then they literally ran to the local government offices, where they handed the letter to a minor official in charge of accepting important correspondence. EW: They stopped at the next city and got a room at an inn. As soon as Rakushun finished writing the letter, they rushed over to the municipal building. The subject of the first sentence is Rakushun: "As soon as they arrived at the next city, Rakushun arranged for a room at an inn." However, the adjective "comfortable" is not used. 2. TP: As they made their way back out of the office hall, Rakushun explained that once the letter had reached its destination, they would probably receive a reply at their lodgings. EW: If the letter was received, Rakushun said, a reply would be sent to the inn. 3. TP: She certainly didn't feel like a king. Still, she wouldn't hold Rakushun back from writing his letters, and she was willing to wait patiently to see what would happen. EW: At the same time, she couldn't shake the feeling that she was a king. Consequently, she did not venture to stop Rakushun from doing what he was doing, and instead did as he asked with all due diligence. "Youko still was not convinced of the gravity of the situation, to say nothing of the complete lack of any feeling that there was anything "royal" about her. But she did not venture to stop Rakushun from doing what he was doing, and did as he asked with all due diligence. 4. TP: "Can't you grab an official and have him go ask? Isn't it urgent?" asked Yoko. EW: "Can't we go grab a bureaucrat and do a lot of begging and pleading?" 5. TP: "We'll just write more until they come calling for us." "You think they'll even bother? How will they know we're telling the truth? They don't know who we are." EW: "We'll keep on calling until they pay attention. This letter I'm sending gets straight to the point." "Do we really have to go to all this bother?" TokyoPop is right about the subject: "Do you really think they'll go to the bother?" The rest of the paragraph is not in the original. 6. TP: Yoko followed curiously after Rakushun as he cut across the square. Soon they stood before a large white building encircled by a white wall of stone adorned with a relief done in gold and primary colors? Yoko thought  the blue glaze on the tiles lining the top of the wall  was startlingly beautiful. EW: Youko tagged along behind him, scratching her head in confusion. Rakushun went to the front entrance of a white building. The alabaster stone walls were adorned with gold and richly-colored bas-relief engravings. The roof tile was a gorgeous blue enamel. 6.1. The addition is not in the original. 6.2. It's definitely the roof tiles that are blue. 7. TP: "The sign says 'temple.' Does that mean a god is worshiped here, like the Emperor of Heaven? Didn't you say most people didn't worship gods?" EW: "A shrine, it says. For worshiping God? The Tentei?" 8. TP: Two guards stood there; they asked for his identification, then waved the two through. EW: Inside the gates were a pair of guards. "Just observing," Rakushun said. They were asked for and presented their identification papers. The noun is "personal identification papers," not "his identification papers" (though this use of the reflexive pronoun is maddeningly confusing). The air inside the structure was still and silent. At the far end of the room  was a large square hole in the wall, like a window, through which an inner courtyard was visible. EW: The handiwork of the doors was exceedingly fine. Inside was a rotunda-like room. An air of tranquility suffused the interior of the building. The wide rotunda faced a wall. There was a large, square window in the wall. Through the window a courtyard was visible. 9.1. This addition is not in the original. 9.2/3. We're both wrong: "A large, square window graced the facade of a rotunda-like hall that reached deeply into the building." 10. TP: On all four sides of the window were shelves that appeared to be altars of some sort, covered with flowers, candles, and other offerings. 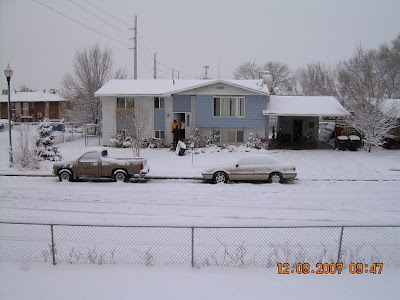 In front of the window, facing it, were four people--two men and two women--praying fervently. EW: What looked liked an altar completely encircled the window. Flowers and candles and offerings were piled upon the altar. At the altar, four or five couples faced the window, fervently praying. Should be: "At the altar, four or five men and women faced the window, fervently praying." 11. TP: Here and there she saw small ribbonlike decorations that had been attached to the branches, and near many of these a large golden fruit was hanging. The fruit on the trees she had seen in the mountains were small, almost berries, but these were big enough to hold with both hands. EW: The white branches bore neither flowers nor leaves. Here and there a ribbon was tied to a branch and there fruits were ripening. The trees in the mountains bore rather small fruit in comparison. These were big enough to wrap your arms around. 12. TP: Yet if there was a way to find out, Yoko thought she would like to know who these people were. My true parents. Somehow knowing that there were people here who had prayed for her to be born helped Yoko to finally accept the truth of her origin. She was born here, in this world, somewhere encircled by the Void Sea . EW: She was struck with the desire to search out the people who had wanted her, see what kind of people they were. Finding the people who had prayed for her birth would finally confirm that this was her birthplace. Under normal conditions, she would have been born in a place like this, somewhere in this world, in the embrace of the Sea of Emptiness. The addition is not in the original, but TokyoPop has the grammatical mood correct: "Knowing that there were people here as well who had prayed for her birth finally convinced Youko of her origins. Under normal conditions, she should have been born in a place like this, somewhere in this world, in the embrace of the Sea of Emptiness." 13. TP: "Over There, parents and children look alike." "Huh. Isn't that kind of weird?" "I think it would be awful strange living in a house with people that looked like you." "You know, maybe you're right." EW: In that other world, children resemble their parents." "Well, that's different. Isn't it a bit creepy, though?" "Hard to say whether it is or not." "When you think about it, probably not." 13.1. The addition is not in the original. 13.2. I misread the negative conjugation: "Seems to me it'd be kinda creepy if everybody in the same household looked like each other." "Come to think about it, you might have a point." 14. TP: "That I do know, actually," Yoko said. Another piece of the bizarre puzzle that was this world clicked into place. 15. TP: Even if you come across the most dangerous sort of animal, if you're near a tree, you mustn't kill it. That's one of the Great Rules." EW: . . . it is absolutely forbidden to capture or kill one in sight of a yaboku. I don't get the sense that this is a proper noun (unlike "Divine Decrees"). LIT: "It is a hard and fast rule." 16. TP: Suddenly, another question rose in her mind, but it wasn't one that she wanted to ask him, so she kept it to herself. The high walls surrounding the place and the guards at the door were answer enough. EW: She had other questions on the tip of her tongue, but they were of a more vulgar nature, so she thought better of asking them here. Like, exactly what kind of hanky-panky went on in the red-light district, that kind of thing. I would amend the first sentence: "She had more whimsical questions on the tip of her tongue." The key noun in the second sentence can also be translated "brothel." TokyoPop seems to have skipped the subject entirely. Unfortunately, the author herself does not settle the question elsewhere. To put this chapter in context, during that six year gap, Taiki would be passing through the secondary education system. In high schools in Japan, the hazing directed at teenagers who "stand out" or "don't fit in" can be particularly cruel. Recall the treatment of Sugimoto in the chapter 2 of Shadow of the Moon. With boys, the abuse is less psychological and mostly physical. So that'd be one more thing Taiki (and Sanshi and Gouran) would have to put up with, along with everything else. 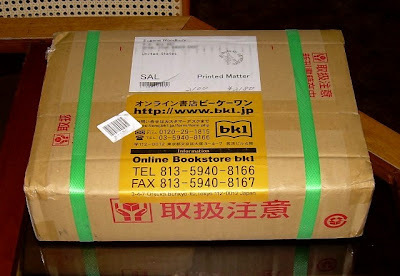 Ah, happiness is a box of books from BK1 (now Honto). To be sure, Amazon has the more extensive and dynamic site, and I often do my window shopping there. But I place orders through Honto. It comes down to one simple variable: shipping. Amazon doesn't offer SAL while Honto does. As a result, an order of this size from Amazon would cost as much in shipping as the price of the books themselves. Shipping SAL is less than half as much. SAL (Surface Air Lifted) treats packages as air mail crossing the Pacific, and then as parcel post once it hits dry land. SAL packages can get bumped from air freight slots by higher-priority mail (like a stand-by passenger), so transit times range from two to three weeks. This box arrived right at the two week mark, probably thanks to increased year-end air traffic. I also appreciate the fact that Honto packages their books so sturdily they could make the journey in the hold of a 19th century steamer. There's another inch of padding inside and the books are sealed in plastic. Domestically, at least, boxes from Amazon often seem to be slapped together with the minimum amount of tape necessary to keep them from falling apart in the mail truck. Although Amazon (U.S.) carries a few SKUs from its Amazon-Japan site, I'm awaiting the day when order fulfillment is truly "flat," in the Tom Friedman sense. That is, in the case of books, you could order any title via ISBN from the U.S. site, Amazon would then accumulate the orders and ship them bulk rate, adding only a small premium to domestic first class S&H costs. 塙果　[こうか]　Kouka; the ranka of the kirin of Kou. dispensation: a divine appointment, arrangement, or favor, as by God; a special privilege granted by a divine authority. The government is gridlocked, stalling urgently needed economic reform. Managers are mired in old mentalities, while imaginative newcomers can't find the space or the capital to develop their ideas. It's a syndrome that's sometimes summed up in a single, angst-ridden question: how come we weren't the ones who invented the iPod? The article is most on point illustrating the willingness of American companies to cross corporate boundaries to do technological mash-ups. The most recent example is the Amazon Kindle. Every reviewer agrees that Sony's ebook reader sports the better design. But Amazon's trump cards are the built-in EVDO (from Sprint) and 90,000 pre-licensed titles. Sony's corporate philosophy, in contrast, seems to be: "Keep your hands off our stuff!" In this sense, Apple is exactly the wrong model to follow. Apple succeeds by carving out small, defensible monopolies for itself. The Switzerland of high-tech companies. The current dominance of iTunes recalls the temporary dominance the Apple II series enjoyed on the desktop. Once Amazon and Wal-mart wean the music industry from its DRM fixation, Apple's advantage will evaporate as well. It will then either abandon its proprietary model, or as it does on the desktop, settle for a small slice of the market as a premium seller of designer goods. smartphones, real-time TV, MP3/video players, cameras, GPS, and digital recorders. And [unlike Apple and Sony] the one thing all of these manufacturers have in common is their willingness to work in a world where open platforms, collaboration, and social networking are becoming ubiquitous. But anime itself offers a successful contrasting case in point. Although large corporations like Bandai and Pioneer have moved into the billion dollar distribution market, a great deal of original content still originates with small studios (as illustrated in Anime Runner Kuromi). Even the famed Ghibli is a garage operation compared to Disney. The manga industry, which generates most of the new ideas used in anime, operates much like professional baseball in the U.S. Rookie artists start out in the sandlot and bush leagues and graduate to the majors. Even the major players usually remain independent contractors, working to please their fans, not under the thumb of distant corporate managers. Fifteen years ago I worked at an Eikaiwa school in Osaka. It was a lot smaller than NOVA, but it had the same business plan, wasn't run very ethically, and went bankrupt at the end of the 1990s. More recently, ethical problems forced English-teaching giant NOVA into bankruptcy. Holding corporation G.Communications picked up NOVA's assets and merged them with the recently-acquired EC English schools. Neither school has a good reputation among English teachers. 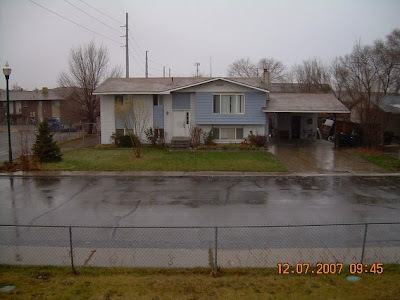 Only time will tell if the new owner will do more than apply a fresh coat of paint. Student can nevertheless make good use of even shadily-run Eikaiwa schools. (NOVA got into trouble for not refunding legitimately-canceled contracts, so read the fine print.) In fact, I would recommend that serious students find the school that offers the cheapest access to a native speaker. Even Eikaiwa "teachers" who haven't studied teaching or grammar know what correctly-spoken English sounds like. Students motivated to study on their own can utilize these schools simply in order to use the teachers as sounding boards. 1. TP: "Apparently, he's my servant. He did call me master, after all. Not that he acted very servile." EW: "He kept going on about how he was my servant and that I was his lord and all. I'm telling you, he had this heavy-duty attitude about him." LIT: "His attitude was very arrogant." I'm good with both versions. 2. TP: "Don't you get it? If Keiki called you master, that means you're the next Glory-King!" "The Glory-King! The king of Kei!" Yoko sat for a while, unmoving. What Rakushun was saying was so unexpected she didn't quite know how to respond. "You're the new king of Kei! It's you, Yoko!" EW: "If Keiki called you Lord, then you are the King of Kei." "The King of the Eastern Kingdom of Kei. The Royal Kei." Youko was speechless with surprise. She could not find the words to respond. "You are the chosen ruler of Kei." My distinct impression from the original text is that Rakushun is speaking more with trepidation here. There aren't any exclamation points in the original. 3. TP: "Uh-uh," said Rakushun, waving a finger. "Until he sits on the jeweled throne, the king is a mere mortal. EW: "Every king is an ordinary person until he sits upon the throne. 4. TP: "That's ridiculous. Besides, even if I were a ... a ruler . . . wouldn't I be a queen?" Rakushun rolled his eyes. "Never mind that," he sighed. "What's important is that the taiho chose you. EW: "This is all so stupid." Referring to "king" or "ruler," the author generally uses the word Ou. The "Royal Kei" is Kei-ou. This is a gender-neutral term (adding the character for "woman" specifically makes it "queen," which the author rarely does). When speaking generically, I translate it as "king." When referring to Youko, I use "empress." To be more linguistically consistent, I should probably use "emperor" and "empress." But I prefer "king" to "emperor" and "empress" to "queen." Throughout most of Japan's history, "emperor" has been a mostly titular role, with the political and military power residing in the hands of the shogun. "Empress" and "king" have more muscular connotations to me. 5. TP: Rakushun continued to look bewildered even as he spoke on. "Yoko. You're not a regular person--you're not even a regular taika. You made a pact with Keiki, did you not?" EW: As he spoke, Rakushun glanced down the road toward their destination. "You may be an ordinary person, an ordinary taika, but you have entered into the covenant with the kirin of Kei." TokyoPop is correct (though the meaning is essentially the same): LIT: "I now see that you are different from normal people and from normal taika." 6. TP: "Yes, he got down on one knee before me and lowered his head. Then--that's right, he put my foot on his forehead!" "That'd be the pact," said Rakushun with some finality "The kirin is a high, noble beast. It bows to no one . . . except the king." EW: He knelt before me, bowed . . . touched his forehead to my feet." "That was it, then," Rakushun declared. "Kirin are dignified and aloof. They obey no one but the king, bend a knee to no one but the king. TokyoPop here repeats a previous mistranslation. The verb means "to touch something to something," such as finger to lips. 7. TP: "But. . ."
"You want to know why? Why you were chosen? Well, don't ask me! How would I know? I'm a wee li'l beastling! I don't hold truck with gods. You know who you should ask? The Ever King!" Rakushun's voice was unexpectedly hard. He stared at Yoko, absentmindedly stroking his whiskers with a single paw "I shouldn't even be speaking to you." EW: "But . . . . "
"I am not the one to fill you in on the details. You should be asking the Royal En instead. I am nothing but a lowly hanjuu. I do not know anything about the Kingdom of Heaven." There was a hardness in his voice. He looked up at Youko. His whiskers wavered and drooped. "You are so far away from me, Youko." Again, no exclamation marks in the original. I think Rakushun's tone is more one of resignation to an unbelievable truth. 8. TP: Rakushun concluded his little speech with a bow so deep his whiskers tickled the ground. Sadness welled in Yoko. "Wait, Rakushun. You don't have to treat me so different all of a sudden! I'm still me." "No ... no, you're not." EW: He bowed low to the ground. It was a pitiful sight. Youko said, "I am who I am." "That is indeed the truth." 9. TP: I'm still the person who's come all this way with you, Rakushun. EW: Rakushun, you're the one I've come all this way with. LIT: "I have walked all this way (up to this point) with Rakushun." 10. TP: "I haven't changed. I'm not someone far and distant. Even when you try to draw away from me--look! You're only standing two steps away." Yoko pointed at the short stretch of ground between her feet and Rakushun's. EW: "I'm not the one who's far away. It's your feelings that are. You and I are standing no more than two steps apart." She reached out with her foot and crossed the distance between them. No further than that, she meant. My use of "crossed" is not clear here. I mean she is reaching out with her foot. Perhaps "indicated" would be better. 11. TP: Rakushun looked down at the ground, then at his short legs. "Yoko . . . that might be two steps for you, but it's at least three steps for me." Shuffling nearer, Rakushun reached out a paw and grasped Yoko's hand firmly. "Sorry 'bout that, Yoko." EW: "It's three steps for me." "Forgive me." Rakushun reached out with his forefoot and touched Youko's hand. "I am sorry." 12. TP: The little paw clutched her hand, and she churned inwardly with remorse for endangering her friend. Could he still be punished for harboring a kaikyaku? Might the demons attack his home while he was away? When Rakushun had said that his mother could take care of herself, was he aware of the danger that she might face from the monsters following Yoko? EW: Holding his small hand, a feeling of complete acceptance welled up inside her. Rakushun had likely committed a crime by giving shelter to a kaikyaku. The youma pursuing her may well have attacked Rakushun's home after she left. He had said to his mother when they left, "You're tough as nails, Mom. I'm sure you'll be okay on your own." There was no escaping the implication in his reassurances that her attackers or some other calamity might soon be visited upon her. TokyoPop is more correct here. I would phrase it: "Holding his small hand, feelings of guilt and regret welled up inside her." 13. TP: The beastling yelped, burying his face in the gray fur of his chest. EW: She ignored Rakushun's odd cries of protest and buried her head in the charcoal gray fur. TokyoPop version doesn't make sense to me. 14. Rakushun's whiskers drooped. "You got a lot to learn about this world, lady." Yoko thought he was probably right. EW: Rakushun's whiskers drooped. "It looks like we need to study you up a bit more about this world. You think?" He spoke in a concerned tone of voice. With no real idea what he was referring to, Youko could only nod and say, "Yeah, sure." LIT: "Youko nodded without really understanding why and said, 'Yeah.'" 代　[たい]　Tai (generation); previous kokushi (国氏) of Tai. 泰　[たい]　Tai (peaceful calm); present kokushi of Tai. 捨身木　[しゃしんぼく]　Shashinboku (shashin + tree); "shashin" is a Buddhist term meaning to renounce the world in search of Enlightenment. 王夫人　[おうふじん]　Oufujin (king + wife); rumored guardian deity of Mt. Hou. 玉京　[ぎょくけい／ぎょっけい]　Gyokukei/Gyokkei (jewel + capital); legendary home of the Gods. "That which they did not then know was written upon their minds." Surprisingly similar to Hebrews 10:16 (Jeremiah 31:33-34): "This is the covenant I will make with them after that time, says the Lord. I will put my laws in their hearts, and I will write them on their minds." Unction: act of anointing as a religious rite; besowing of a divine or spiritual influence upon a person.